Steam on the Stirling line - colour feature on the ex-Caledonian route from Glasgow to Stirling. Pontypool Road as I knew it - Edward A. Evans recalls a once-important railway centre on the 'North & West' route between Hereford and Newport. A Milk and Fish Diet - colour photos of milk and fish trains. Railways and Epsom Races - Part 1 - Jeffrey Wells describes how railways were built to serve the famous racecourse at Epsom, home of the Derby and the Oaks. Exploring a York Backwater - three colour photos of the Foss Islands branch. Crossing the Tyne and Wear - Michael B. Binks describes the engineering challenges in crossing these rivers in the North East. 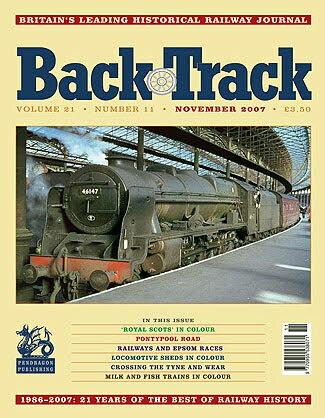 Going round the sheds - a four-page colour feature on steam locomotive depots. Here comes British Railways - J. Crosse looks at some early staff notices from the newly nationalised organisation. Salute to the 'Royal Scots' - four pages of colour photos of this famous LMS class. The Bombing of Britain's Railways: A War Diary 1939-45 - Part Four - John W.E. Helm concludes his survey with the results of the attacks by V1 and V2 flying bombs and rockets. Good and Faithful Servant - Part 2 of Michael Rutherford's round-up of the British 0-6-0 locomotive. Sanction Wood, Railway Architect - Part 2 - by Gordon Biddle. Cross that Bridge when you come to it - colour photos of a selection of railway bridges.